Makers 1-on-1 is our original interview series featuring today's makers and DIYers. We're sitting down with new makers every week to learn more about their projects, how they acquire information, their purchase processes, and their passions. 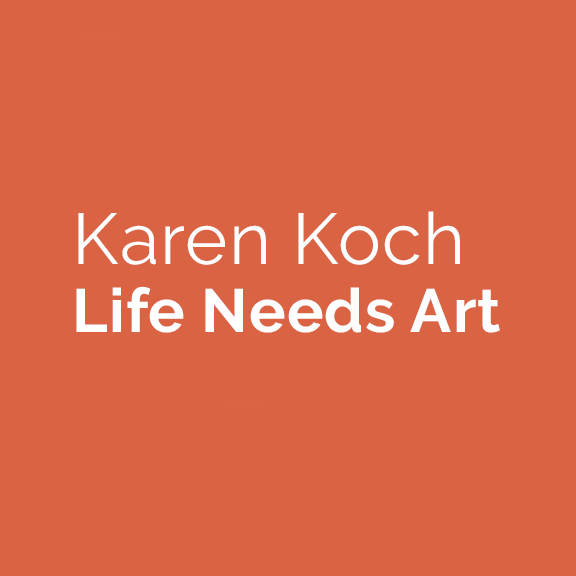 This week, we’re interviewing Karen Koch, the collage artist from Hudson, OH behind Life Needs Art. 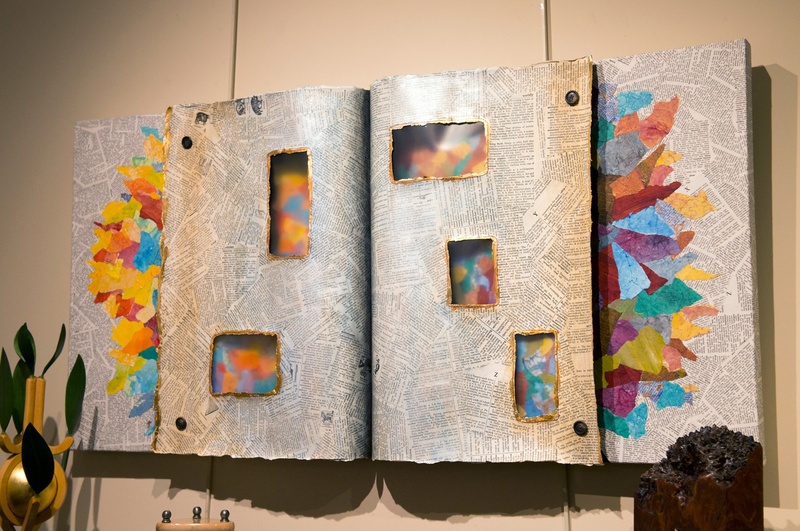 Karen transitioned from a corporate position to pursue visual art full time and draws inspiration from nature, books, and paper in general. 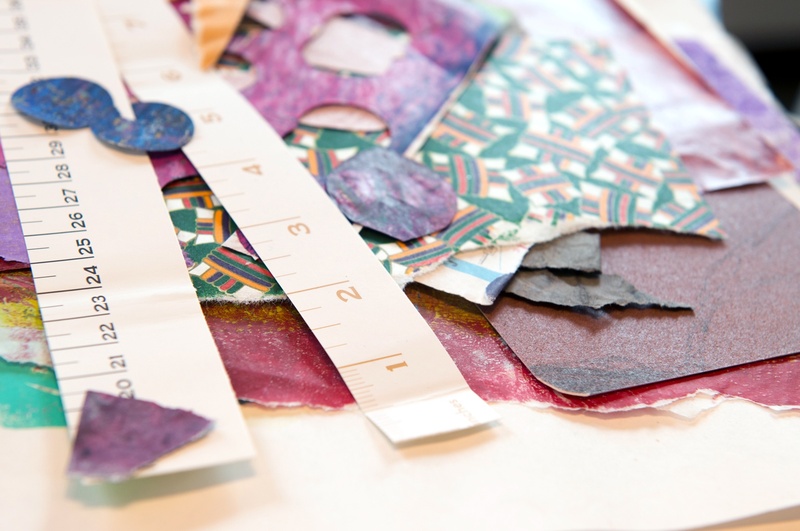 For her multimedia collages, she uses envelopes, buttons, thread, adhesives, and many different kinds of paper. 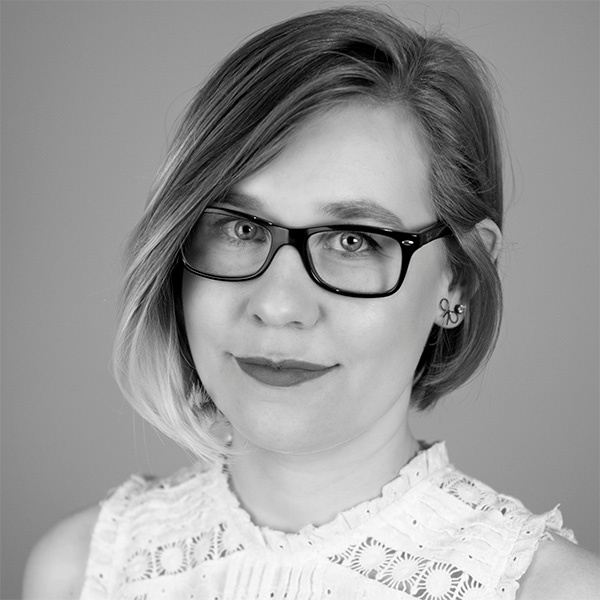 If your brand sells to visual artists or papercrafters, this 1-on-1 interview with Karen will give you important insights that can help you reach makers like her. What's your name and what do you do? 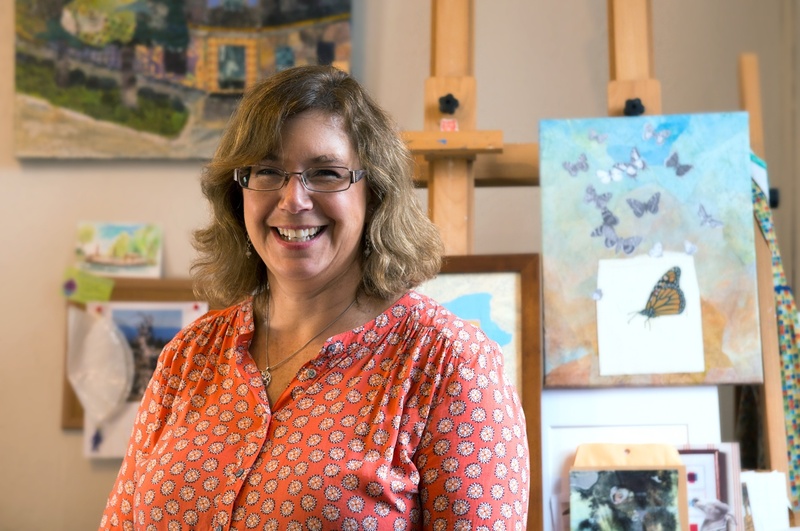 I’m Karen Koch and I’m an artist here in Hudson, Ohio, and I do collage and mixed-media art. Most of it is abstract. How did you get started doing this? What steps go into creating a piece of art? Normally I work on a stretch canvas and I cover it with something to get it started. The one I’m working on right now I’ve covered with pieces of a map, or sometimes I’ll cover it with old book pages. I have a couple of old dictionaries that I just love because the paper is gorgeous. They’re from the 1800s, so the paper is that really good-quality paper, and the typeface is just beautiful to look at. I’ve got a French art history book that I use too. So that’s a good way to get started. And then I start building the image up from there using pieces of paper. Now sometimes they’re paper I’ve found, I’ve got some wallpaper samples here, and origami paper, sometimes I paint my own papers, just so that I have colors that might work for my project. Sometimes I’ll add paint or stitching, I love to add buttons and thread to my projects, so sometimes I run them through the sewing machine. My sewing machine is right here in my studio, or sometimes I add hand stitching. How do you choose which materials to use for each piece? It’s color and texture. Sometimes I start with an idea in mind, so I’m pulling things that I think might work for my project. If I don’t have enough of the right color if I’m trying to do a fall tree scene and I don’t have enough of the golds and yellows and reds I need, I might paint some papers or look for papers. Sometimes I just start with papers that look interesting. I’m always reading books on collage and mixed-media art. I have a couple from the library sitting at home on the couch right now. I watch videos, I read blogs, I always want to see what other people are doing. And of course going to shows, talking with other artists. I love to know what’s going on so I’m trying to keep up with it. Where do you get information in regards to products? A lot of it is online. Reading other people’s blogs and seeing how they’re putting their work together and what products they use, a lot of time I go to manufacturers’ websites or retailer websites and read reviews of products that customers have left. And sometimes it’s just trial and error. I’ve got a Facebook page that I use for a lot of my finished artwork, so once something is completely finished, I’ve photographed it, I put it up on my website, blog about it and put it up on Facebook. I also have an Instagram account that I use for more of the quick, in-process photos. So as I’m working on something and I’m getting excited about what’s happening or I’m stuck on it and I need feedback, that’s where I tend to put some of those intermediate shots. I have a Pinterest account that I use for keeping track of ideas, I’ve got a Twitter account that’s just sort of the catch-all for everything. A lot of it is nature inspired. Change of seasons, flowers, trees, that kind of thing. I do also work in series, so some of it is starting with a sketch, wordplay, expanding on an idea. [This one here] is part of my Roots and Road series where I’ve been playing with the idea of knowing where your roots are and being grounded as you grow and change. I’ve [also] been working on an envelope series, so I’ve been thinking about envelopes as wrappers and containers and ways to hold things, they’re not important in and of themselves, but they’re important as the carrier for a message. How do we enclose an idea and keep it safe until it’s delivered, how and when do we deliver it? So a lot of the pieces have envelopes just as a design element. How much time do you tend to spend on a piece? Small pieces might take a day or two, some of the bigger things could easily take two weeks, three weeks. They don’t tend to go longer than that. I might work on a couple of things at a time, but I do try to finish them. It’s pretty rare that I [will] start something and set it aside for months or years. You do watercolor painting as well, is that for work or for fun? Mostly for fun. I’ve been doing sketching for a couple of years mostly to keep my skills up and keep me active. I find that the better my drawing skills are the better my other work is, even the abstract stuff. If I’m working on something abstract and it’s just not coming together, it’s usually because my drawing skills are rusty. I have a couple of friends and we get together once a week and we go sketching, hit coffee shops and libraries or outside. I had a chance to go to an International Urban Sketching Symposium over the summer, which was fun. 550 people from all over the world sketching in Chicago for a couple of days, it was really neat. How do you display your work and get it out there? Art shows, online, obviously we have the gallery space here, I do outdoor art fairs, I’m doing one in Virginia in a couple of weeks, I’ve got things over at Hudson Fine Art and Framing. What's the most rewarding part about what you do? It’s a couple of things, for me I think visually, so being able to do things that are tactile and colorful is really essential to who I am. I HAVE to do this. 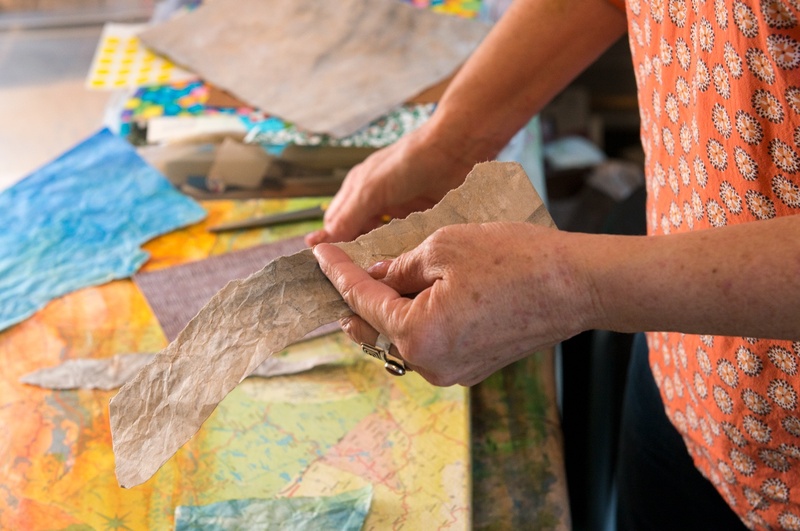 The other part is then getting other people involved and that’s partly why our studio space is open to the public, so that people can come in and see what happens to make a piece. Because you walk into a gallery and you see things up on the walls and it can be kind of mysterious. You know, it’s all nice and shiny and cleaned and varnished and you sometimes wonder “Where did that come from? How did that happen, how did they get to that point?” So I like for people to be able to see “the mess,” to see how things come together. We also do events here in town, we’ve started an Art Hop, and that’s again a way to get people involved and active. Usually here we have interactive projects, so a lot of times we have a full-size table size coloring page that people can color. Right now we have a card making project, where people can just make and take just to try their hand at it and play with the art a little bit. What's the art community like in Hudson? Within the Uncommon Art co-op] Dana, who makes jewelry, her and I have had studio space on Main Street for four years, we’ve been in this place for not quite two. When I left my full-time job to become an artist, I knew it would be better to do it outside [of my home], among other people. Being an artist is really solitary, so it helps to have other people around to talk to and bounce ideas off of. Then when this space opened up, it had room for a third person so we asked Shannon to join us. You need people to talk to, if I were to spend all day long inside my head, that would just not be good. Tell us about your shift from the corporate world to the creative one? I left [my corporate job]. Being an artist, a full-time artist, was something I had dreamt about since I was a kid, and when I got out of college I worked for art galleries for a couple of years. Then we hit a recession, so there goes that, right? So I had worked in corporate jobs, office jobs for 25 years or better. About 10 years ago I realized I really wanted to do this, that this was something I had to at least try, because I didn’t want to get to the end of my life and look back and think, "I really missed that opportunity, I missed that chance and regret not having done it." So five or six years before I left my job I started planning for it. I started working on my artwork, building a portfolio, entering shows, building a network of other artists to communicate with and trade ideas with, and saving money (setting aside that nest egg so I could be able to take the leap). We tell the story that one summer Dana, who’s my neighbor across the street, sent me a text and said “Hey we’re having neighbors over for beer tonight, come on by.” So I went over, we’re doing the usual “Hey how’s it going? How’s work?” and I said, “Everything’s fine but I’m thinking about doing this [leaving job to pursue art. ]” Dana goes “Wait what? Wait a minute, if you really want to do that I’ll do that with you.” She’d been doing the same thing, making jewelry at home, sitting on her couch because she didn’t have a studio space, doing shows and selling her jewelry. So we started looking for space, found a space up the street, signed a lease and the next thing you know, six weeks later I’m turning in my notice at work. But it all just came together. But it wasn’t always a smooth transition, as I said I worked for art galleries after graduating, and then had to leave that and take an office job. And you know how office jobs are, they take as much you’re willing to give them. And before I knew it I was working long hours, weekends, and I didn’t have time for art. I didn’t do anything for 12 or 13 years and then again hit a point where I realized, wait a minute. It [the office job] wasn’t satisfying something in my soul, I think visually I need this. This is a huge part of who I am. How do you deal with challenges that arise? Challenges with art just happen. There’ll be shows you don’t get in or someone else gets the prize or whatever. You just learn to sort of roll with it, you can’t take it personally. With trying to do this as a public-facing business, it helps immensely to have other people be your support system and bounce ideas off of. If I were trying to do this entirely by myself, I wouldn’t make it. It’s inevitable, we’ll sit down and start brainstorming ideas, having an event or doing something special, or even naming the place. It makes a world of difference to have other people to talk to. 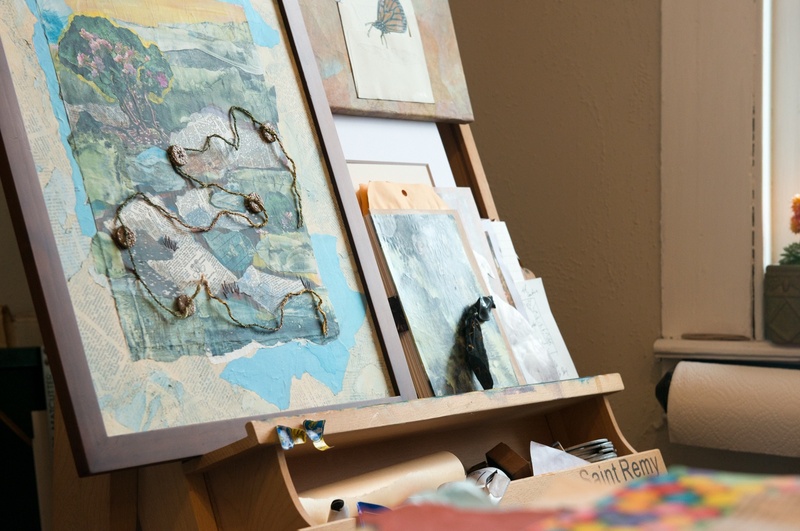 The nice part is Hudson has a really active arts community, you might not know it at first glance. Hudson Fine Art and Framing, the owner of that place has been incredibly supportive. She has a whole show of my artwork right now. She’s one of the organizers of the Art Hop that we do. There’s another gallery further down the street and we work with her all the time, we work with the shop owners and the businesses. I just did a coloring page for the kids’ menu at Peach Tree, the Southern restaurant up the street. It’s kind of funny because the street we live on, we jokingly call it Artist Row because everybody in every house is an artist, for blocks. It’s really wild. My next-door neighbor is a graphic designer, he’s made his living as a solo artist for decades. I’ve never lived in a place like this. I’ve lived all over the country, but I’ve never lived someplace that has that high of a concentration of artists. What's next on the horizon? Well I’ve got an out-of-state show which is the first time I’ve done that, so that’s kind of exciting, I’m a little nervous about it.